Dust mite bites are one of the misunderstood insect bites around the world. It has been blamed as the source of allergies and many other skin irritation with unknown cause; but what really is a dust mite bite? Are dust mite bites possible or is it simply misunderstood? What are dust mites? All of these questions shall find answers in the succeeding paragraphs as you read on the complete guide on dust mites and what they bring. 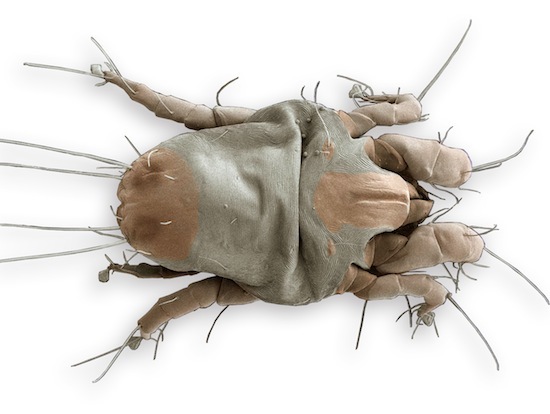 Dust Mite Bites of Knowledge – What is a Dust Mite? A dust mite is also known as the house dust mite. There are two primary kinds, the European dust mite and the American dust mite. Both bugs are not parasites though. They do not feed on living tissue, only dead skin cells shed by humans and animals. They are so small that more than a hundred dust mites are present from a single gram of dirt found in a typical house with dust mites. Dust Mite Bites – Does a Dust Mite Bite? To answer the question above, since dust mites are so small, it is not possible for them to bite humans. Although dust mites do not bite humans, and they do not carry diseases, their excrements can be harmful to people with asthma and those who have an allergy to their excrements. More so, dust mites is usually mistaken for another bug, the bed bug, which does bite humans. Feeds On Dead skin from animals and humans. Blood from animals and humans. Size Microscopic. Dust mites are so small that 100 or more can be present in a gram of dust. A square yard of carpet in a house can have as much as 100,000 dust mites on it. Â A few millimetres long. A typical adult bed bug is easily seen by the naked eye especially when it has just fed and is swollen with blood. Harm Created Dust mites can have a harmful effect to people who are allergic to their feces. Asthmatic individuals may become more prone to an asthma attack when exposed to dust mites. What may have been misunderstood as dust mite bites can be bites from the bed bug or a skin irritation caused by other causes. Bed Bugs bite animals and humans. They can cause severe skin irritation especially to those with sensitive skin. Dust Mite Bites – What Causes the Symptoms? Since dust mite bites are practically impossible, one can be baffled then at what harm does a dust mite bring to humans. For the most part, they are harmless creatures, but then, they produce one of the most common allergen in the world, their excrements. The dust found in a typical household has many constituents, but a major part of it are the waste produced by the house dust mite. These waste can trigger asthma and allergic reactions to a very significant number of individuals. Though we have no need to worry about dust mite bites, we do have to be concerned about the other effects they do bring in a home infested with them. If a person manifests some of the symptoms above and dust mite allergy is suspected, seek medical consultation to ensure that the right diagnostic tests are taken and other conditions are ruled out. Dust mites live on warm areas with a lot of moisture content. It is why their primary habitat are pillows, blankets, beddings, duvet and carpet. Dust mites do not like very dry areas as well as very hot temperatures. To treat infested materials like pillows, they can be placed inside the household clothes dryer with the setting turned to the hottest possible temperature. It is recommended that the temperature of above 105 degrees Celcius must be kept for than minutes to effectively eradicate dust mites. DOT or disodium octaborate tetrahydrate powder can also be use but this can cause eye irritation. Frequent vacuuming is also advised to prevent or minimize problems thought to be caused by house dust mite bites. Considering the fact that dust mite bites do not harm humans or are not even possible, we must shift attention to asthma and allergy which dust mites can cause. To get rid of the risk that dust mite brings, it is pertinent to know how to combat dust mites.